Do any of you have a parrot that you you can't handle? 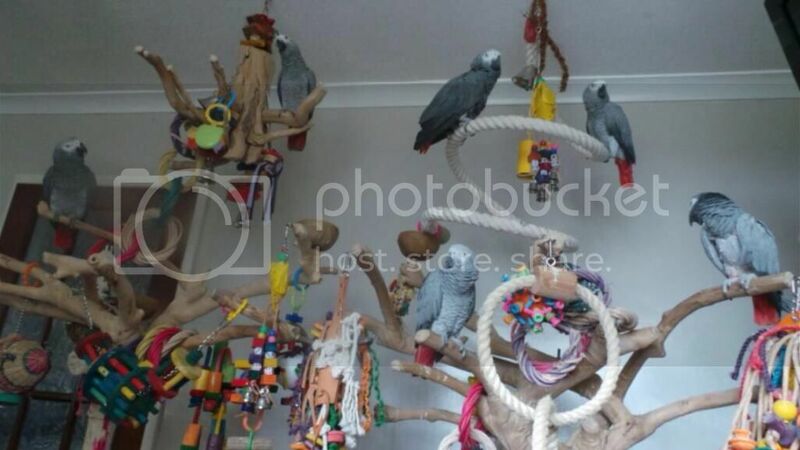 I dont have any experience with older parrots, but if he hasn't been handled in 10 years I would say it might be early days? I would have thought that it's good that he happily sits on your shoulder though. Its all about trust and time in my opinion. I think that the fact that he's letting you pick him up and hold him might suggest that he just needs to get used to it, as he's not been handled for so long. fingers crossed, just keep going with him, the bites are a fact of life really, Mandi has a couple that she can't handle though. Sometimes he only needs to think once sometimes this can go on for a couple of hours but he always gets there in the end. Please help me, I don't know how to post on Avian Avenue, any help out there? We have had our Grey since a baby. She bonds with my husband but over the years she has learned to love me! When I hold her tho and go to put her down, she has a firm grip on my finger and won't let me put her in the cage and will bite me! My blue front is a rescue bird and for 27 years he was in a cage with a small perch and never held! Never out of the cage! I've owned him for 3 years now and he now is out of the cage all the time, loves me and lets me scratch his head and kiss him but has only gone on my finger once! I love him dearly! If I get Jack to step up then he gets exactly like Bella. He is fine then starts nipping which gets harder and harder until I react. If I just let him out without standing on my hand first he gets really aggressive within a couple of days and starts to actually launch himself at me and my partner and really biting no warning nips.